Cubic zirconia jewelry sparkles like diamonds, but at a fraction of the price. If you're in the mood for more jewelry but your budget can't handle the cost of expensive gemstones, cubic zirconia pendants, earrings, rings, and more may be able to give you the look you want at a price point you can afford. A kiss on the hand may still be quite continental, but these days cubic zirconia jewelry often replaces diamonds as a girl's best friend. Why? Cubic zirconia jewelry is every bit as beautiful as lookalike styles in diamond jewelry, and you don't have to wait for a special occasion or a bonus in order to buy it for yourself. Cubic zirconias can be set in a variety of ways, just like diamonds. They look great as the three-carat focal point of a beautiful engagement ring or as pave setting accent stones in a piece of jewelry featuring another larger stone, like the pearl in the DiamonArt® Cultured Freshwater Pearl and Cubic Zirconia Sterling Silver Ring. There's another perk: when buying cubic zirconia jewelry, you can be fairly safe that no one's life was at risk during the process of creating the stone. Mining diamonds is a dangerous, back-breaking task, and the difficulty it takes to harvest them from solid rock is reflected in the high cost of these premier gemstones. On the other hand, cubic zirconia (CZ) can be manufactured in a laboratory/factory setting, producing synthetic jewels that are nearly dead ringers for true diamonds. For the cost-conscious, cubic zirconia jewelry is a less expensive alternative to the real thing. You can get stunning, quality cubic zirconia pieces, most often set in sterling silver or gold-plated metal. You'll pay a fraction of the cost of diamond jewelry set in white or yellow gold. Cubic zirconia jewelry is most often white or clear; however, it's possible to tint the stones by adding a variety of metal oxides during the synthesizing process. You can find cubic zirconia in most major department stores, but you may welcome the wider variety that you can find by shopping online. Emitations offers rings (even engagement and wedding rings), necklaces, bracelets, and earrings. You can find colored cubic zirconia pieces alongside the more traditional white stones. If you've seen a very expensive diamond item that sadly will never be within reach for the average person, check here. There are exquisite designer knockoffs on the site. Almost Diamonds has a beautiful selection of wedding sets, celebrity-inspired pieces, and designer-style jewelry created to look like items designed for Tiffany, Cartier, and more. If it's a simple sterling silver pendant with colored accents you're seeking, you may want to check here as well. Inspired Silver not only has cubic zirconia jewelry, but they also frequently run sales. This is a great place to get your CZs for even less. You can even get a replica of Kate Middleton's engagement ring, Reese's emerald cut solitaire, and more. Browse by category to find the rings, bracelets, necklaces, earrings, and wedding sets that you want. Fantasy Jewelry Box has imitation diamonds and fashion jewelry, and you can view all the cubic zirconia pieces at once or narrow it down based on whether you're looking for a bracelet, ring, necklace, or earrings. HSN.com offers quite an eclectic selection of cubic zirconia jewelry, so if you want something a little different or completely zany, check there first. You can also look on Overstock.com or Amazon.com. Though they don't focus on cubic zirconia jewelry like the other sites do, they do tend to have inexpensive items featuring CZs. CZ jewelry should be kept very clean, since body oils and other pollutants can dull the crystals. Since these simulated jewels are so hard, it's safe to use any standard jewelry cleaning solution and brush to keep them in top condition. 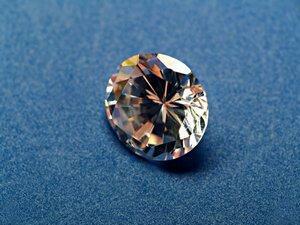 With proper care, it can be hard to discern a cubic zirconia from a diamond when viewed from a distance. The mass manufacturing of CZ since the 1980's has resulted in an abundance of these popular diamond look-alikes. Even though CZ is less expensive than true diamonds, it doesn't mean that all jewelry made with it is cheap. Quite the opposite is true, and many fine quality broaches, earrings, and necklaces are made using these crystals in combination with precious metals and a bevy of complimentary gem stones. The next time you visit a jewelry store, give yourself a little test. Ask your jeweler to show you two rings, one diamond and one CZ. Compare them and see if you can tell which one is which without being told.